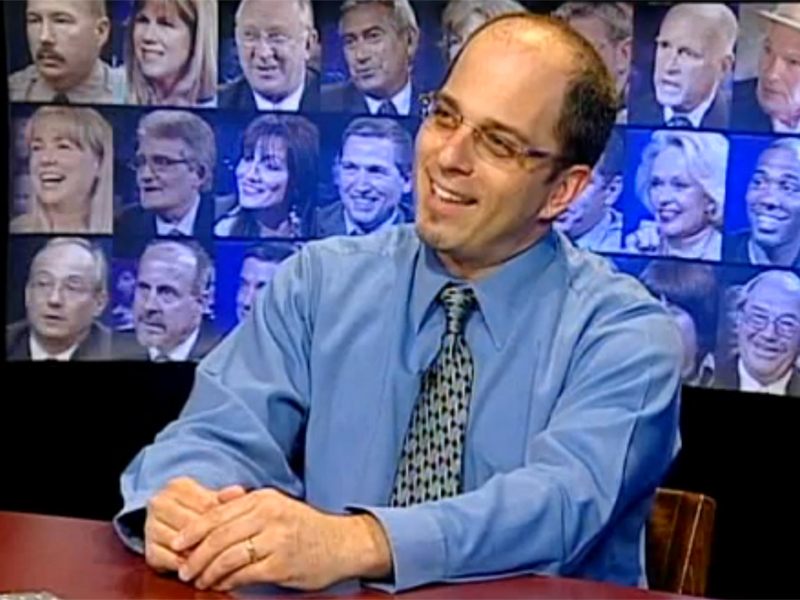 Adam Philipson discusses the PAC season lineup on an episode of SCVTV's "Newsmaker of the Week" program in June. Adam Philipson, managing director of the Santa Clarita Performing Arts Center at College of the Canyons for the past five years, is leaving. He was recruited by a headhunting firm for the position of chief executive officer of the Count Basie Theatre in Red Bank, N.J.
Philipson, 45, described his decision to take the job as bittersweet. “I’ve become a part of this community,” Philipson said, during the course of increasing the visibility and stature of COC’s 886-seat theater, which opened in 2004. Philipson is only its second managing director. But it was serendipity. Philipson’s father lives in New York, and he’s been ill. Philipson was quietly wondering whether an opportunity to move back East might present itself when the call came. It’s also a good career move for the New York City native who came to California 25 years ago and helped launch the Broad Stage in Santa Monica as assistant director. Built in 1924 as a vaudeville house, the Basie has “a lot of connectivity to the community,” Philipson said. “It’s a huge economic engine” for the town’s restaurants, hotels and shops, which fill up when there’s a performance, he said. The Basie is run by two nonprofit boards, Philipson said, one that oversees operations and one for fundraising, and they’d been looking for a new CEO for some time. Philipson will be responsible both for operations and development (money) – and while COC added to his operational experience, he points to his involvement with funding the Broad Stage when queried about his fundraising background. “The show must go on,” said a press release from COC officials, who praised Philipson for leading the PAC to new heights and expanding the college’s arts education program in local schools. “Adam’s tireless efforts and passion for the arts have helped bring in thousands of new fans to the PAC, while at the same time his K-12 Arts Education Outreach Program has meant exposure to the arts for thousands of students throughout the valley,” COC Chancellor Dr. Dianne G. Van Hook said in a statement. Philipson is expected to be sitting at his desk in New Jersey on Nov. 5. He said he and his family will be winding up things in Santa Clarita by late October. Philipson and his wife have a 2-year-old son and an 8-year-old daughter who attends Valencia Valley Elementary School. The college has not yet said how it will fill Philipson’s position. “It is expected that in the coming days, the college will announce an internal candidate to manage the day-to-day operations of the PAC until a new director can be found,” COC officials said.